Benjamin Wong is a designer and filmmaker currently living in NYC. His previous work has been recognized with Webby and Addy awards, and clients have included MTV, AT&T, Smithsonian, Kid Rock and Seal. 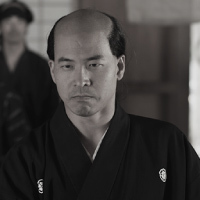 The Old Samurai is the third short he has written and directed, and he is currently developing two low-to-medium budget high-concept features. Celia is a filmmaker and fine artist living in Downtown Los Angeles. A former advertising executive, digital strategist, and the second-youngest California Delegate to the 1992 Democratic National Convention, her first screenplay, A Band of Angels, was optioned by independent film producer Richard Kiratsoulis (Monster, Havoc, The Upside of Anger). During Celia's 2010 Film Independent Project:Involve Screenwriting Fellowship, she produced Represent, a short film written/directed by Academy Award-nominated writer Iris Yamashita (Letters From Iwo Jima) with Executive Producer Justin Lin (Fast & Furious, Better Luck Tomorrow). The Old Samurai marks the second time that Celia has produced a short film directed by Benjamin Wong. Celia is currently developing two features - a noir thriller set in Los Angeles, and a comedy. Boa Simon is a Boston raised and Los Angeles based cinematographer. Boa's narrative work has been recognized by the American Society of Cinematographers and the Academy of Television Arts and Sciences; his commercial work is broadcast internationally. Alisa is a freelance Editor based in the Los Angeles area. Since receiving a B.A. in Visual Arts from Rutgers University, she has worked in reality television, documentaries, and on both studio and indie features. The Old Samurai is the first collaboration with Director Benjamin Wong and the third with Producer Celia Esguerra. Alisa is currently working on a feature documentary. Christopher Guanlao is a member of the alternative-rock band Silversun Pickups. He was born and raised in Los Angeles, where he graduated from the Los Angeles County High School for the Arts. Over the years he has performed as an actor and as a musician. This is his first foray in composing for film. Standby Painter/Set Decorator Jim Winstead, Jr.